Documents relating to the defection of Igor Gouzenko, the RCMP investigation, the espionage commission, the spy trials, and the public response to the defection. In 1945 a young, frightened Russian cipher clerk working in the Soviet embassy in Ottawa left one night with several top-secret documents clutched secretly beneath his coat. Igor Gouzenko carried a terrible secret with him, one he hoped would buy him asylum: evidence of a Soviet-led spy ring operating in Canada. In response, the federal government instituted a royal commission to track down the spies. By invoking the War Measures Act in peacetime to detain suspects indefinitely, and implementing a royal commission to interrogate them, the government succeeded in circumventing the judicial system [royal commissions can force individuals to testify and can deny witnesses access to legal counsel – the commission’s transcripts were later used at trial to prosecute the accused]. 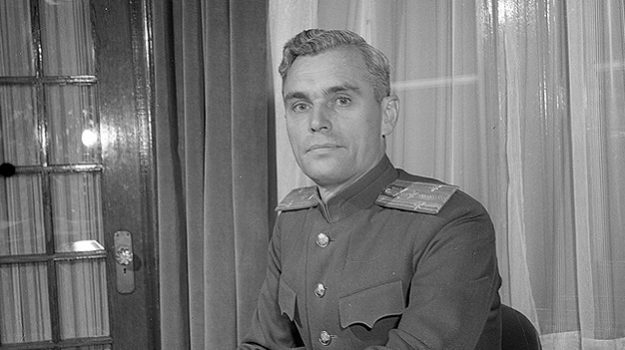 The following documents are related to Gouzenko’s defection and the subsequent espionage commission. 10 September 1945, RCMP updates Norman Robertson (secretary of state for external affairs) on the Gouzenko situation. 11 September 1945, Norman Robertson explains the situation to Soviet officials. 25 September 1945, Department of External Affairs memo on the legality, under international law, of holding a defector from the USSR. July-August 1946, correspondence between Senator Arthur Roebuck and Minister of Justice Louis St. Laurent regarding the detention of several suspected spies. Igor Gouzenko’s official statement to the RCMP on 10 October 1945. E.K. Williams’ top-secret memorandum to Mackenzie King. Williams, the president of the Canadian Bar Association, recommends the use of a royal commission to circumvent the due-process protections of the legal system. The following oath was taken by all the RCMP officers who were detailed for guard duty at the Rockcliffe Barracks, where the suspected spies were held under the authority of the War Measures Act. The royal commission’s mandate as defined in PC411. The Final Report: A complete copy of the royal commission’s final report. Excerpts from the interrogations: What motivated the accused to spy for Russia? and Testimony from sitting Member of Parliament Fred Rose. 1. That, because of the introduction into the evidence, necessarily and unavoidably of secret technical data, the publication of which, according to the witnesses most concerned, would not be in the public interest at this time, none of the Evidence or Exhibits relating to any top secret, secret, restricted or confidential matters be published except with the approval of the Government in consultation with the Heads of the Services, Departments or Organizations concerned. 2. That the proper authorities in each Service, Department and Organization take such steps as may be considered desirable and effective, in the light of this Report and the Evidence and Exhibits, to prevent further unauthorized transmission of information and to set up further safeguards. 3. That all security measures should be coordinated and rendered as uniform as possible. 4. That the Evidence and Exhibits accompanying this Report be placed before the proper persons in various Services, Departments and Organizations affected, to study so that a complete evaluation of the information and materiel handed over can be made in each case to ascertain in detail what, and what has not, been compromised. That consideration be given to whether the findings so made should be communicated to the proper authorities in the United Kingdom and the United States. 5. That the Official Secrets Act, 1939, be studied in the light of the information contained in this Report and in the Evidence and Exhibits, and, if it is thought advisable, that it be amended to provide additional safeguards. 6. That consideration be given to any additional security measures which would be practical to prevent the infiltration into positions of trust under the Government of persons likely to commit acts such as those described in this Report. Toronto Star, 15 June 1946. Toronto Star, 27 June 1946. Letter from the Civil Rights Union to Justice Minister Ilsley, 5 February 1947 (Library and Archives Canada, Louis St. Laurent Papers, vol. 19, file 100-9). Summary of a memorandum from the Civil Rights Union to Mackenzie King, criticizing the decision to implement a royal commission. Civil Rights Union Newsletter 1, 4 (December 1946). Civil Rights Union letter to Minister of Justice J.L. Ilsley, 5 February 1947. Update on the status of the spy trials, 29 September 1947 (source unknown). The press became increasingly critical of the government’s actions following the publication of the first interim report on 2 March 1946, which revealed that David Shugar and eight other suspects remained interned at the RCMP’s Rockliffe barracks. A key theme in the media’s coverage was the suspects’ civil liberties. The media wrote about, among other things, family members’ attempts to contact the detainees, lawyers criticizing the government for preventing them from speaking with their clients, and Matt S. Nightingale and Fred W. Poland‘s relatives failed attempts to secure writs of habeas corpus in court to force the government to release them. A survey of six English-language papers found 8 to 15 editorials each on the espionage affair within a two-month period. While editors for the Montreal Gazette and Halifax Herald were quick to support the government’s actions, editors for the Winnipeg Free Press, Vancouver Sun, Evening Citizen and the Globe and Mail criticized the commission’s tactics. In contrast, the affair received limited attention in French-language newspapers. Le Devoir provided limited coverage of the commission and the spy trials, but the issue rarely hit the front page of the paper, and the newspaper rarely discussed the restrictions on the suspects’ civil liberties. Action Catholique, for instance, did not comment on the issue at all. The only story that dealt with the commission was an editorial that pointed to the defections as an example of French-Canadian moral superiority (all of the spies were English-Canadians). February 23, 1946; March 16, 1946; March 23, 1946; March 30, 1946; April 6, 1946; June 29, 1946. Canadian Forum (monthly): February, 1946; March, 1946; April, 1946; September, 1946. Maclean’s Magazine (weekly): April 1, 1946; September 1, 1946. Dalhousie Review (monthly): April, 1946. Canadian Bar Review (monthly): September, 1946 (Fyfe); October, 1946. Fortnightly Law Journal (bi-monthly): March 15, 1946; June 15, 1946; September 16, 1946; January 4, 1947; February 15, 1947; March 15, 1947; June 16, 1947.